As a matter of state, it is an undisputed fact that King Juan Carlos 1st (baptized Juan Carlos Alfonso Víctor María de Borbón y Borbón-Dos Siciliasis) is the crowned head of Spain. 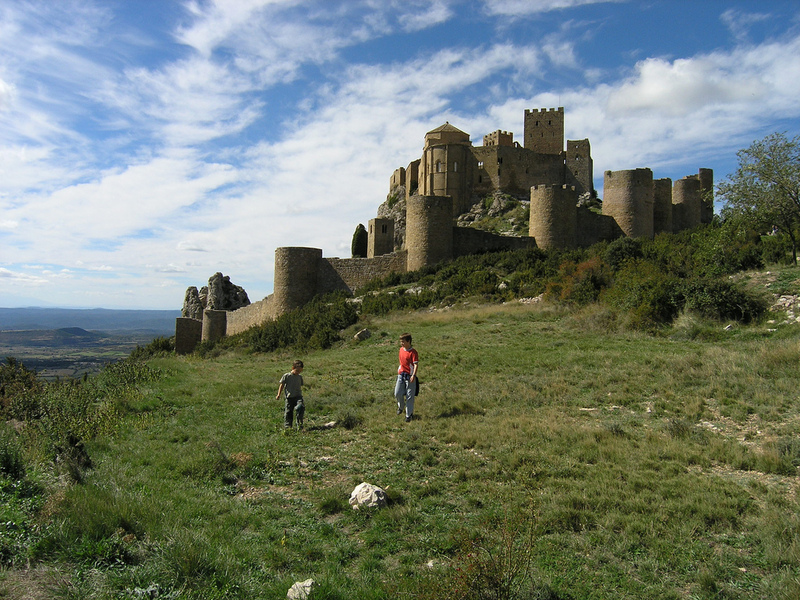 Lobarre, one of the most important Romanesque castles in Europe and a key southern frontier outpost of Aragon influence in the 11th and 12th centuries. As a matter of the vine, the undisputed king of Spain is Garnacha! Spreading far and wide across the Iberian peninsula and pushing north through the Pyrenees into the southern Languedoc-Roussillon and Provence regions of France (where it is known as Grenache) this robust, generous and fruit-packed varietal is always satisfying, sometimes exploding with flavor. Originally propagated throughout the Mediterranean region under the almost 700-year reign of the kingdom of Aragon, Garnacha slowly captured the imaginations of new world winemakers as well. In Australia it is blended with the classic southern-French varietals of Syrah and Mourvedre to create some of the most full and friendly summertime wines with which grilled meats will ever share a table! California also has followed this lead with some lovely efforts comprised of similar blends coming mainly from the central coast region around Paso Robles. In France’s southern Rhone valley district of Chateauneuf-du-pape, Grenache makes up the lion’s share of the the blends, often producing extremely profound and age-worthy wines. 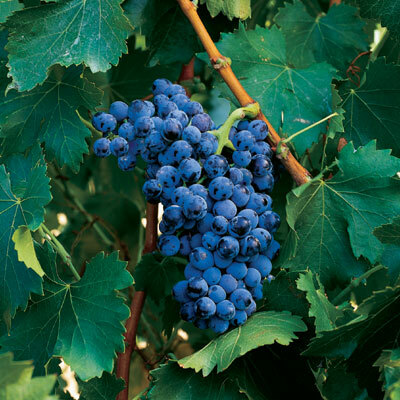 The grape is a later-ripening sort and when yields are held in check it can produce decidedly rich and full wines with lush, dark berry flavors of currants and black cherries. Simultaneously, it can express intriguing notes of fresh coffee grounds, black olives and pepper. These intense aromas and flavors often parade alongside more savory elements like tar, game, leather and roasted nuts. But let’s jump back to Spain for a minute. I recently tasted some truly lovely and great-value wines from the Campo de Borja district where Garnacha is the undisputed (with all due respect and fealty to the house of Borbón) king! In this region where cold winters with low rainfall, hot summers and strong winds blowing off of the 2300 meter peak known as the Moncayo force the vines to struggle with the elements, wines of often considerable dimension and character are born! The first wine I tasted was the 2010 Borsao Tinto. This is a solid effort with great typicity exhibiting nice minerality as well as characteristic, soft, black pepper. It sees 100% stainless steel vinification and is a blend of 15% Tempranillo for structure and 85% Garnacha. Its slightly savory profile and hints of tar and coffee ground are nicely complimented with lovely black cherry fruit. It has good balance with cleansing acidity and a focused finish of medium length and retails for around $9 per bottle. Next, the 2009 Coto de Hayas with its inviting aromas of black raspberry, violets and hints of fennel performs a wonderfully-synchronized dance between purity of fruit, supple tannins and bright acidity. This is a wine comprised of 100% Garnacha that sees four months in new, French oak barrels which add structure and subtle elegance. It is a great retail value for $14 per bottle! Another wine that was very well-built was the 2009 Quo Old Vines which sees 6-8 months in French oak. It had at once a sweet and savory aromatic profile with an intriguing palate of black cherries and plums, exotic spices, black tea accented with menthol and pine notes that made for a whirlwind of sensations! The wine had lovely texture and a very harmonious and lengthy, fruit-driven finish. It is a fine value at around $15 per bottle! Another very compelling wine of considerable dimension was the 2008 Alto Moncayo produced from 50-yr. old Garnacha vines. One the nose this wine offered up inviting aromas of soft, red peppercorn and exhibited intense and almost jammy black raisins. The palate was bursting with black cherries and black raspberries and exhibited great weight and intensity as well as a silky texture. Sweet licorice and pomegranate were woven into this wine’s identity and refreshing acidity afforded a persistent finish that made this offering simply irresistible! For around $30 retail per bottle this is one to take to your next dinner party. It was so refreshing to sit in the company of these highly-expressive Iberian wines, all of which faithfully captured the soul of a region whose identity for generations has been interwoven with that great emissary known as Garnacha. From its royal beginnings via the kingdom of Aragon to its vastly-evolved profile in modern-day Spain, it has proven to be one of the country’s most time-honored and visible ambassadors, inspiring the craft of artisan winemakers around the world!